Sister Marlene Shapley and Father John Mannion offer a prayer moments after placing some very special rocks she had collected while on a pilgrimage to Italy in 2007. 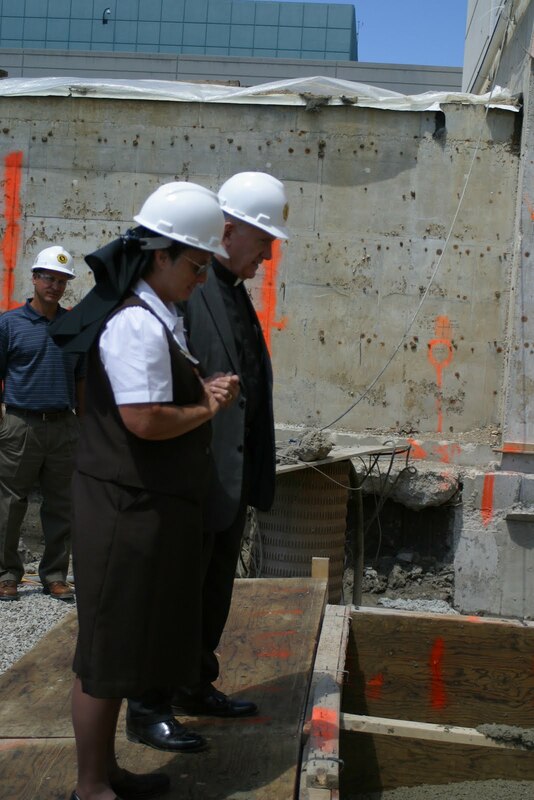 INDIANAPOLIS -- Some very special material is part of the concrete foundation on which a six-story Bed Tower will rise at St. Francis Hospital’s Indianapolis campus. Surrounded the hum of construction and rumbling of trucks rolling in and out of that site on June 23, Sister Marlene Shapley, vice president of mission services and Father John Mannion of Spiritual Care, stepped forward and cast six stones into the foundation’s newly poured concrete. And it marked the completion of an idea that surfaced nearly a year ago while on a pilgrimage to Italy with Chief Operating Officer Keith Jewell and other St. Francis Hospital family members. While in Italy, the trio visited San Damiano – the place where Francis heard the words of the Christ who said, “Francis, repair my church for it is falling into ruin” – where they were given a stone as a keepsake. They also collected stones from Carceri, a hill top area above Assisi that Francis and his followers often went to pray; The Portiuncula, another one of the churches that Francis repaired; La Verna, where Francis received the stigma of Christ; and Greccio where Francis re-enacted the living Nativity. The rock-placing ceremony began in the lobby of the nearby Heart Center, where Sister Marlene explained the significance of what she was about to do to a group that included Robert J. Brody, CEO and president. “Symbolically and quite literally, the expanded hospital is being built on our Franciscan tradition,” Sister Marlene said.